In the earlier two posts, we covered what is the PLM software and its application in the apparel, fashion, and textile industry. In this post, we will see few popular fashion PLM software and PLM solution providers. This is a flat list of PLM software suppliers. To know the best Fashion PLM suppliers in the world, you can further read and explore in Whichplm. 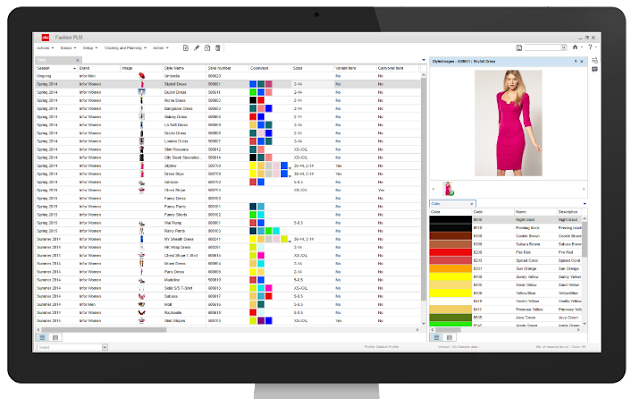 BlueCherry by CGS Inc: BlueCherry® PLM is a best-in-class product lifecycle management solution for Apparel Fashion, Accessories, Lifestyle and Footwear Brands, providing a comprehensive set of tools to manage your entire product lifecycle. Centric software: Centric PLM links design, merchandising, planning, product development, product testers, sourcing, procurement, production and retail teams with a one ‘actionable’ source of truth platform to eliminate rework, errors and lost time by improving team collaboration. Infor: Infor Fashion PLM delivers a single set of accurate, real-time data that helps increase visibility and provides the foundation for closer collaboration and unified teamwork. Seamlessly link vital areas of the fashion value chain to your business—from line planning, design, and development to supply chain sourcing and in-season consumer-driven design changes. Infor Fashion PLM helps fashion brands, manufacturers, and private brand retailers develop and change styles quickly and efficiently. YuniquePLM by Gerber Technology: YuniquePLM® helps companies communicate with their global vendors about their creative direction much sooner in the product lifecycle. Information can be shared as early as the pre-positioning phase when designers begin fleshing out plans for colors and patterns for the upcoming season. This early data sharing gives sourcing teams and vendors time to perform preliminary costing and to start preparing the right textiles. This eliminates the need for designers to re-enter fabric specifications into another system at a later date. Lectra Fashion PLM: Lectra PLM helps optimize the fashion and apparel product development process to meet strategic goals. NGC Software: NGC Software, founded in 1982, is a leading provider of cloud solutions for Supply Chain Management (SCM), Product Lifecycle Management (PLM), Quality Control (QC), Vendor Compliance (VC) and Enterprise Resource Planning (ERP). NGC’s Andromeda® platform empowers the “Digital Supply Chain” by linking retailers and brands with their vendors, factories, suppliers, agents, logistics providers, and other global trading partners into a unified, real-time network, along with a full range of consulting services. PTC Inc. Since 1985, PTC has been enabling customers to stay one step ahead of the competition by combining strategic vision with leading, field-proven technology. PTC technology helps companies to quickly unlock the value now being created at the convergence of the physical and digital worlds through the IoT, AR, 3D Printing, Digital Twin, and Industrie 4.0. With PTC, global manufacturers and an ecosystem of partners and developers can capitalize on this promise of physical digital convergence today and drive the future of innovation. Visual Next: In this era of mobility and remote collaboration, companies are required to move faster from concept to production, by managing complex product development efficiently and cost-effectively. Visual PLM is an Out-Of-The-Box solution for Apparel, Footwear and Accessory companies, built for quick implementation and is configurable to accommodate unique products. Simparel PLM: Simparel becomes Exenta PLM. Simparel PLM EVO streamlines approvals, change management, line selection, vendor quotes and bids, compliance and other global processes. Real-time information and analytics keep everyone working on the same page and supports better-informed and more timely business decisions. Simparel PLM EVO provides the same caliber of transactional and analytical reporting capabilities as any other core enterprise system. This allows you to slice, dice and deliver dashboard reports on any and all metrics relevant to your business. RLM PLM: RLM PLM (Product Lifecycle Management) is the fashion software solution that enables your teams to keep all of your important product development, tech pack, and product cost information in a single, secure and accessible location. WFX web PLM: WFX apparel PLM software, a 100% could based product, streamlines production, connects global offices & departments including design, merchandising, planning, production, and sourcing. WFX Web PLM software for fashion is a product lifecycle management software that enables easy collaboration among internal teams and vendors keeping everybody on the same page and working on a common platform. Popular fashion PLM software brands and solution providers. Improve business speed and product delivery by using PLM.